The state is so large it is actually it's own "floristic region", which is how botanists categorize botanical areas of a continent. This means many of the wildflowers in Texas are native only there. But that's only the beginning. The best part is that the Texas native bloom is widespread and extremely intense, which makes it very different from bloom in other regions. 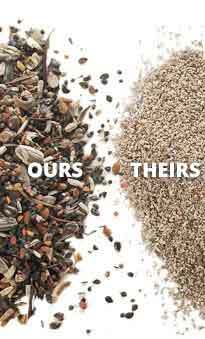 This is what so few Easterners understand. The basic difference is because most all the East, north to south, was originally wooded before European Settlement. That means the native wildflowers in the east are almost all woodland plants, such as the trilliums and lady slippers. 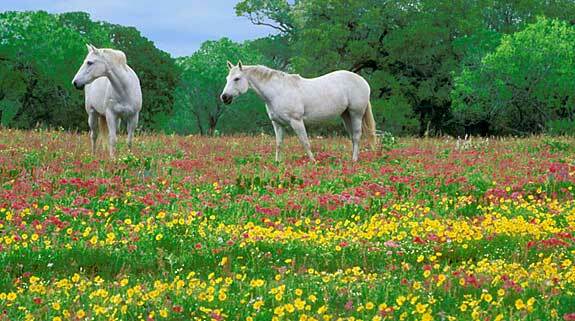 Two happy horses in a Hill Country meadow of coreopsis and red/pink Drummond Phlox. Photo by Don Paulson. But in Texas, there have always been huge expanses of almost treeless grassy areas. And that makes all the difference. Native species evolved in Texas that love the open sunny places, and have put on a show there forever that Easterners can't even imagine. Oh, in the East, we have lovely natural bloom in fields and along our roadsides in summer, but that's absolutely nothing compared to what happens in April in Texas. During April of 2004, Katie Sherrod, a well-known Ft. Worth journalist and friend, took an auto trip from Ft. Worth down into the Hill Country to have a good look at the season's bloom. She was kind enough to share her journal with us. So if you like wildflowers, read and enjoy. And plan a trip for next year. There are maps, tours, festivals and statewide hotlines as everyone chases the best displays of flowers each spring. It varies a bit year to year, but it's always a wonderful outing for anyone, and a real eye-opener for wildflower gardeners from other states. When you go, you'll see—there's no natural wildflower show in the world that can match April in Texas.